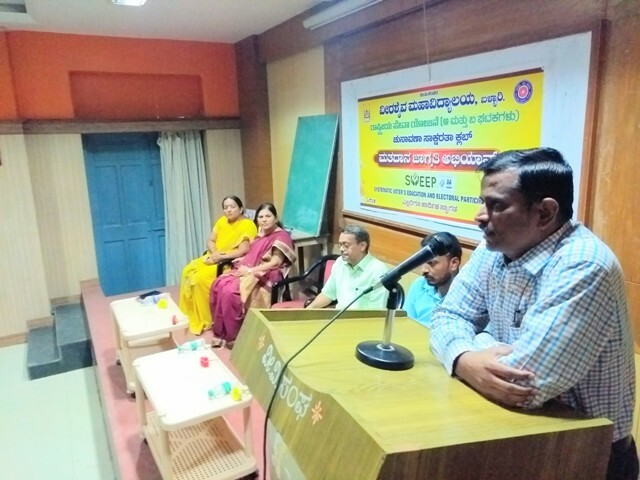 Shri Chandrashekhar Gudi, Planning Officer, Zilla Panchayat, Ballari, inaugurated the programme. He insisted on the students to take active part in democracy by casting vote on the day of election. He also asked them to create awareness among their neighbours with regard to the importance of voting. Voting allows citizens to say their opinion & choice on a variety of issues. Every vote will have success of democracy. He also said that if a large percentage of citizens cast their vote compulsory they can get good governance by the elected persons. Dr.G.Rajashekhar, Principal, presided over the function. The staff also participated in the awareness programme.